Is Warner Bros. Relying Too Heavily on Batman? I’ve been meaning to write on this topic for quite a while now, but since recently it came out in the news that next year’s Batman vs. Superman is supposedly even less a sequel to Man of Steel than we initially suspected and is much more a Batman story. But even if you discount the whole Batman vs. Superman issue, there’s still the matter of what they’re doing with their home video releases. This year alone, Warner Bros. have released seven straight-to-video animated movies and one more that’s due before the year’s out. Every single one of them features Batman in some way, shape, or form, and half of them have him specifically in the title of the film as the main character. You have to go back four years to 2011 to find a year where Batman made up less than half of that year’s line-up, having only Batman: Year One released alongside the other actually non-Batman titles All Star Superman, Green Lantern: Emerald Knights, and the live action Green Lantern. Yes, I understand that Batman is still the most popular character in DC. He’s their bread and butter, the money maker, he’s a billionaire for a reason: he makes billions for Warner Bros. and DC. But where is the saturation point? Cinephiles are already claiming that we are reaching critical mass for superhero movies, and while I disagree with that statement, I do think that there is way too much Batman specifically. Even in live action, he’s going to be in two movies next year as the main character in Batman vs. Superman and in a minor role for the Suicide Squad film, not to mention however many more animated films he’s going to appear in. There seems to be a new series of animated titles every couple years now. It started out with just the regular Warner Premier, DC Animation titles that had a mix of superheroes. Some Superman, some Batman, some Green Lantern, some Justice League, and a Wonder Woman. Now the mix has shifted to variations of Batman. There’s the main Batman titles with Damian Wayne, there’s the Justice League titles based on the New 52 which may be going away soon now, but they’ve already got their replacement in the toy-friendly Batman Unlimited series that’s already two movies strong this year. And on top of that, there’s the Lego DC Comics movies that have featured Batman alone as well as the Justice League as a whole. And speaking of Lego, when the theatrical Lego movie came out last year they obviously had access to the DC heroes since it was under Warner Bros. Animation and it didn’t take them long to announce Lego Batman in a stand-alone sequel in the near future. What is it about this single character that allows for so many different variations? Is he really that much more popular than any other DC hero? Or is it just that by his nature and longevity that he allows for a wide range of takes on his character. Because of his Adam West comedic roots, he’s easily adapted to the parody style with Lego. Because of his dark and gritty Frank Miller and Christopher Nolan variations he can be pushed in that direction in the PG-13 animation and live action. And he can fall somewhere in between in more family friendly, but still action-oriented animated fare. But when you look at the other DC heroes, there’s not quite so much wiggle room. Green Lantern hasn’t fared too well in either animation or especially live action. The animated movies seemed to be favorable to fans and some critics, but they obviously didn’t sell nearly as well as the Batman titles. The same goes with Wonder Woman, which is a shame since it wasn’t really given much of a chance outside of her single stand-alone animated title and various supporting roles in the Justice League animation. She just hasn’t had the chance to find her ground as a lead figure. Hopefully the upcoming DC Super Hero Girls line will include some movies that aren’t overly treacly. In the long term, Warner does seem to be setting up a few more DC heroes in the live action arena, with Aquaman, Flash, and Wonder Woman finally getting her own live action movie that begins filming in just a couple short months. But that said, it also wasn’t all that long ago that news broke on Warner and DC offering yet another solo Batman movie with Ben Affleck directing. And as much as I think it’s a great choice for a story to adapt, next year brings one of the most anticipated Batman titles to be adapted into animation with Alan Moore’s the Killing Joke, adding yet another Batman title to their line up. Give Cyborg his own film, or even Catwoman. Aquaman and Flash have had the focus in Justice League films, but give them their own totally solo film. Martian Manhunter even. Heck, give Superman a little bit more love, he’s been short on animated stories lately too, though he’s had plenty in the past. There are tons of characters out there besides Batman, so DC: please give them a chance. Until next time, this has been Bubbawheat for Flights, Tights, and Movie Nights. Posted on September 11, 2015, in Blogs, DC and tagged animation, batman, DC, film, movies, warner bros. Bookmark the permalink. 14 Comments. The DC brand has struggled in competing with the Marvel brand for a long time. At issue is not actual amount money made, but creating a cohesive brand identity. The happy accident that let Stan Lee and a small number of artists lay the foundation of an united universe gave Marvel the edge. DC had such a huge body of characters , writers and artists to support output gave them a production advantage in the 60s, but as a consequence their cohesive universe and brand identity took a hit. This problem has continued to plague them and can be seen in the recent attempt to translate the brand into a cinematic realm. They seem more successful with television animation and live action ( Flash & Arrow). The episodic nature of of the shows and the ability to course correct if things go wrong or surprising success requires plot & character modification seems to work to their advantage. They are able to distill the essence of the long character history in the shows. When a they attempt to do this in the movies, they seem to have trouble deciding on what to use and what to leave out. I suspect the reason they go for the dark interpretation and as a consequence gravitate towards Batman, is that that portrayal has been the most consistent. They fear the 60s comedic style because it poisoned the well for a long time so that they over compensate with seriousness. I do think that TV is the one place where they do try more variety and have some surprising failures, like the success of Flash, Arrow, and Teen Titans Go and the failure of Beware the Batman. I don’t have as much knowledge of the comics history so I appreciate your insight. Thanks for commenting! Great post (was planning to write up a similar piece myself this weekend but more about BvS), Batman is easily my favourite comic book character. He has a versatility that other characters don’t and as you’ve cited we have the camp and goofy takes together with darker and grittier versions. But, I agree that Warners/DC are relying to heavily on Bats. It was disheartening to hear that further solo Superman films are on “permanent hold” and that BvS appears to now be a Batman film guest starring Superman (with a bit of Wonder Woman thrown in). At least on that front Warners are developing Wonder Woman, Aquaman, Flash and Green Lantern live action films but we really need to see some non-Batman animated features. I’m still waiting for there to be a classic Superman animated feature on the level of The Dark Knight Returns and Year One. Agreed, but those other live action properties save Wonder Woman are farther down the line and WB has already shown themselves willing to alter their slate. I am excited about the rumored possibility of Green Lantern being a Green Lantern Corps film. The darkest that Superman ever got was Superman vs the Elite if you haven’t checked that one out yet. But still, I wish they’d cool it. I think Nolan did Batman the best justice you could for live action, and I’m not really interested in seeing Affleck take a swing at it. I’m in “if it ain’t broke..” mode, I guess. 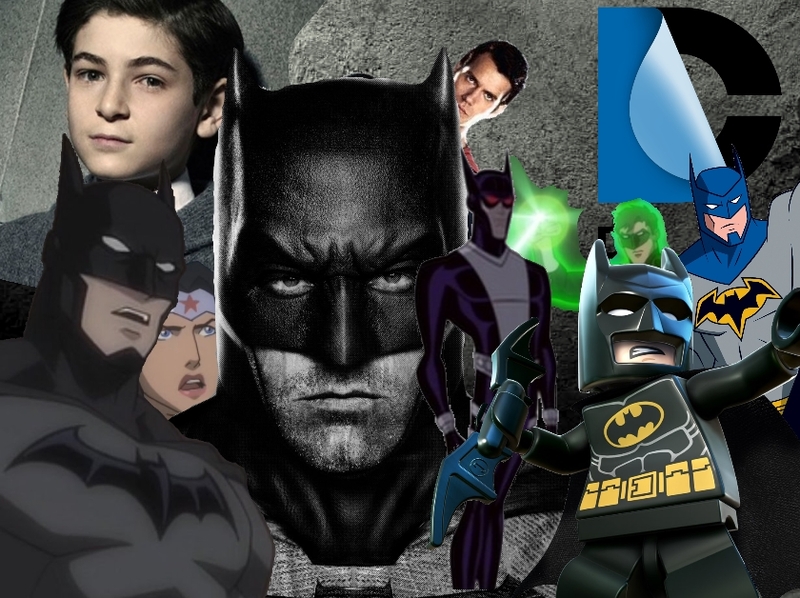 There are fans of the other characters, but it does seem like Batman is far and away the easiest one to connect with audiences where the movies and WB are concerned. As for Teen Titans, I enjoy the show in small doses, but I have noticed that there isn’t anyone who dislikes the show, they either like it or hate it with the passion of a thousand fiery hells. It’s one of Cartoon Network’s most popular shows, if not the most popular, for what that’s worth. I too wish they would expand their output to other characters and not rely on The Bat so much. I like Batman, I simply don’t need to see him all the time. Seems like it was only a few years ago when there was a good mix of DC heroes on the big and small screen. I wonder if it is just something as simple as Batman consistently out-selling any of the other heroes. I am a huge Batman fan, but even I recognize they’re just shoving him in every possible crevicein hopes to draw in some.of his massive fanbase. So I see it as a combination of his popularity and the versatility you speak of. He can be presented so many ways and be believable in all of them. He is also the most complex, and therefore, human of the DC characters. His story and lack of superpowers strike a chord with people. Howevr, I fully agree DC needs to make a better effort at growing the fanbases of other characters. They should be embarrassed that Marvel can make smash hit movies about lower tier players like Guardians of the Galaxy while they struggle to get their tentpole characters onto the screen with a reasonable amount of artistic and financial success. The Batman v. Superman movie feels like a messy rush job that is going to cram as many supeheroes down our throat as possible without doing any of them justice, so there could be a certain irony to their collective moniker. Hope I’m wrong, but they should have really followed Marvel’s lead and built a universe instead of trying to jump right into the middle of it. A Wonder Woman flick, a Flash movie, and a straight up Man of Steel 2 would have been perfectly fine. I’m a huge DC fan and if I ever have to choose between dc or marvel, I will still choose DC. Batman is a great and complex character, but is far from being my favorite. As much fun as the Marvel series has been, I’m quite disappointed that they have never been able to jumpstart a JLA series or even a Legion of superheroes series. my all time favorite DC characters are Captain Atom and Waverider….those would be some great stories to tell. I’m with you on Green Lantern, I enjoyed every bit while they were in space, it was just a handful of things that really dragged it down. I’m not too familiar with DCs wealth of characters just because they constantly stick with the old standards and I haven’t watched much of the cartoon series that spread out among the rest of their stable of characters.